You’re probably familiar with the basics of IntelliApp and what it can do for you. But how much do you know about how it’s working to make your recruiting process more efficient and effective? The IntelliApp, for all its obvious advantages – its ease of use, its mobile-first attitude, its DOT-compliance—is more nuanced and complex than most people give it credit for. Even if you’re already seeing huge gains by using IntelliApp, there’s a lot of merit in knowing what’s going on in the engine compartment – it helps you see why there’s value in helping drivers apply more easily to your company. So, without further ado, let’s take a look under the hood at what makes the IntelliApp truly exceptional. The IntelliApp has been hard at work for a while now, connecting drivers with carriers and filling empty seats more quickly and easily than any paper process could. To date, more than 3.7 million drivers have submitted more than 17.1 million IntelliApps through Tenstreet. That’s a lot of potential employees – and most of the entire truck driving population – who have saved time and effort using our online application. And every single one of them will be able to fill out future IntelliApps even faster since the majority of their information will be available to pre-populate. Simply speaking, adopting the IntelliApp means making your application process easier for millions of drivers – and counting. So how well does app pre-population work? As of now, 2/3 of applications submitted come in with some amount of pre-population. That’s a lot of repetition removed and makes your company easier to work with, even if your app has custom questions or other specifications. It’s especially helpful given that only 13% of all driver application sessions result in a completed app due to factors like the speed-bumps of having to hunt down information about previous employers, the annoyance of typing a lot of information on a small mobile keyboard, and the sheer amount of time it takes to fill out all the DOT-compliant information needed. The numbers speak for themselves: over 75% of our pre-populated driver application sessions result in completed applications. That’s a lot of additional talent coming across your recruiters’ desks each month. We talk a lot about the IntelliApp being mobile-first (not simply mobile-friendly) – meaning we design it for the smallest screens first. And it’s for good reason – in the past month, 75% of completed IntelliApps were filled out on a mobile device. Overwhelmingly, drivers live on the road and require the convenience of being able to fill out job applications using a handy device like a cell phone. A recruiting process that doesn’t consider what 7 out of 10 drivers prefer is ignoring the needs of its workforce. The IntelliApp leverages its network effect in all kinds of ways that help both drivers and recruiters save time and energy. One example is in our database of carriers, which contains more than 50,000 companies that can be selected as a previous employer by applicants. Selecting a company from our directory automatically populates that employer’s information into the driver’s IntelliApp and also saves your company time when you go to request an employment verification for that carrier through Xchange. The bigger our network grows, the bigger the gains are for both sides of the hiring process. Trucking companies know that having a compliant hiring process is crucial, but it’s hard to keep up with all the changes at the federal and state level. The IntelliApp automatically adapts based on the latest Ban the Box and Pay Equity Laws. For example, if you’re seeking drivers in a Ban-the-Box state, all criminal background questions are automatically removed from your IntelliApp. Similarly, if a state you’re hiring in has adopted Pay Equity Laws, questions about compensation in previous positions will be removed – keeping you in line with the law. While we’re talking compliance, have you noticed IntelliApp’s dual signature process? We’ve made it as easy as possible for drivers to handle the DOT’s requirement to provide multiple signatures as stated in regulations §390 and 391. At the end of their application, drivers are able to quickly sign separately – once for their application release, and again for their drug and alcohol and employment releases. If a driver is interested in your company, it should be as easy as possible for them to see what positions are available where they live. 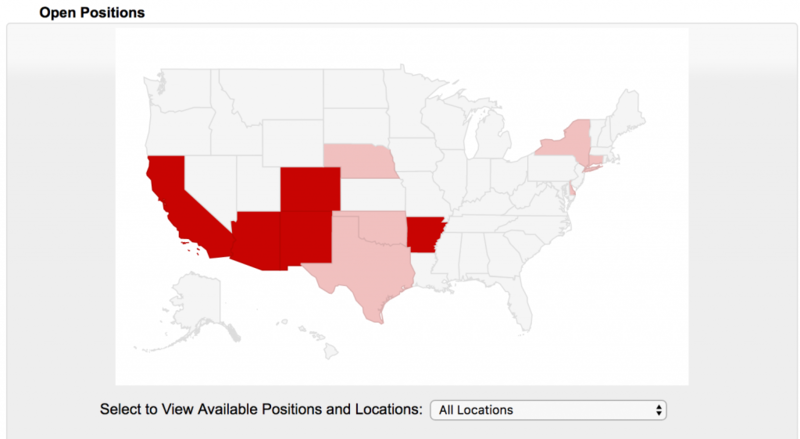 IntelliApp knows this and provides an assist by showing a heat map of all the states where you have open positions that lets drivers see what jobs you’re hiring for in their neck of the woods. This lets them select and apply to the jobs that best suit their skills. 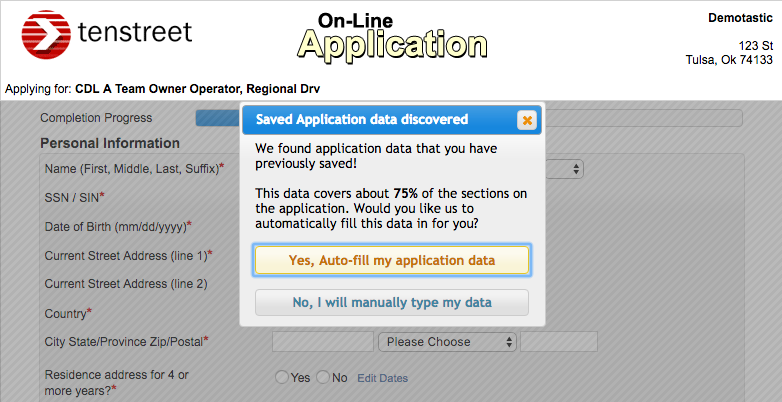 Having drivers’ prior employment information saved helps them save time when they fill out IntelliApps, but it also helps carriers in the event that drivers alter what information they show certain carriers. IntelliApp’s built-in DOT gap-checking cross-references the information they’ve provided on an IntelliApp with prior employment information provided in previous applications to detect gaps in employment – getting you a better picture of a driver’s employment history. Of all the talents the IntelliApp possesses, being versatile is probably one of its most distinctive attributes. Not only can you choose the color scheme that fits your company’s image, the IntelliApp also affords you the ability to add your own custom questions and ask additional questions based off the answer(s) a driver gives. Now that’s true flexibility! 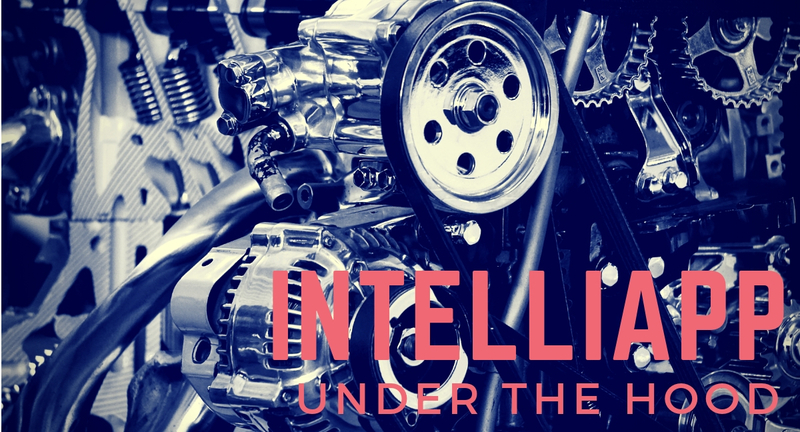 We’re always working to keep the IntelliApp a well-oiled machine, inside and out. Want to know more about how IntelliApp connects to Tenstreet’s other features and services to provide even more gains? Check out Part 2 of our IntelliApp coverage!